LNC takes over the state VW distributors in WA (Western Motor Co Ltd), giving them direct control over Volkswagen sales in all states except QLD and SA. Moving of the Volkswagen business into the North Ryde headquarters, together with the LNC Industries administration and their other subsidiaries, is completed. Lanock Motors opens another new branch at Bondi Beach, on the corner of Roscoe and Gould Sts. The Lanock Motors VW Parts warehouse is moved from St Leonards to North Ryde, opening up room for LNC to sell Fiats at the St Leonards agency. The old Volkswagen distribution yard at Lidcombe and the temporary St Leonards office on the Pacific Hwy are closed. The Beetle gets minor updates, including two blocks of five cooling louvres in the engine lid and silver-painted wheels, and no more chrome strip on the dash. The Type 3 range is extensively updated a larger, redesigned nose, much bigger bumpers and lights, rear semi-trailing arms, and fuel injection. The ‘Type 3’ badge fitted to the front mudguards is unique to Australia. A smaller-engined ‘economy’ version of the Beetle is introduced mid-year. It has the same body and ball-joint/swing axle suspension as the 1500, but with the old single-port 50-bhp 1300 engine and front drum brakes. It has a ‘1300’ chrome badge on the engine lid. 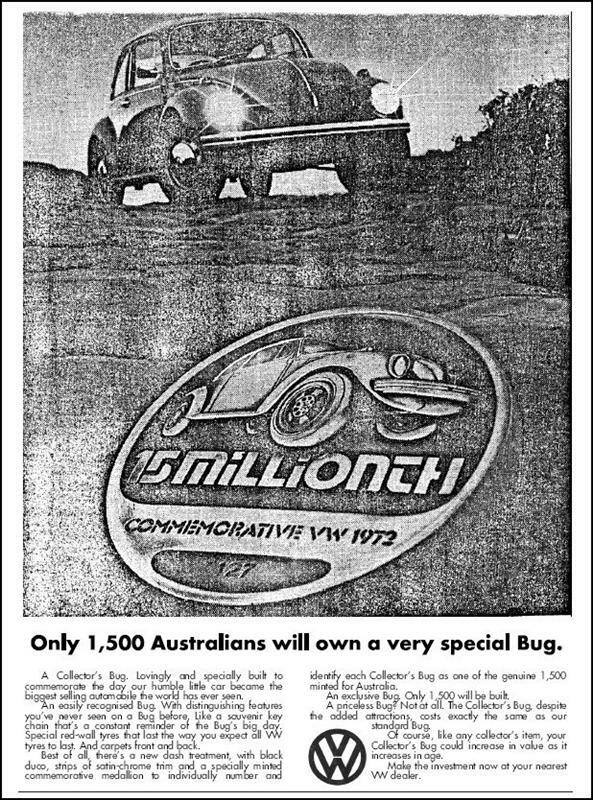 The 300,000th Australian Volkswagen is sold in June, but no official ceremony marks the occasion and it passes unnoticed; probably, with all the corporate upheaval, the company was unaware of the milestone. The new 16,000 km 1970 Ampol Bicentennial Trial is organised (Captain Cook discovered the east coast in 1770). Like the 1964 Ampol it stays on the east coast, going no further west than Alice Springs. It attracts 226 entries – 83 ‘expert’ teams and 143 ‘novices.’ Only 3 VWs are entered by the pros, all VW 1500s. The amateurs enter 8 more VW 1500s, and 9 more 1200 and 1500 Beetles, making 20 VWs altogether. 10 VWs made it to the end, the best of them the Cusack VW 1500 of Robert Tanner / John Sedaitis, 16th overall. However they did win the 1100-1500cc Class B, with the Gary Perkins / Trevor Wyatt VW 1500 third and the George Daniel / Wolfgang Slide VW 1500 fourth in class. The Perkins / Wyatt VW also won the ‘Under 25’ driver award. The joint overall winners were Jean-Claude and Lucette Ogier (Citroen DS21) and Hans Schuller / Edgar Hermann (Datsun 1600). Colin Bond / Tony Roberts in a Monaro GTS350 were third. Mitsubishi won the Teams prize. VW’s days of dominating reliability trials were over. The interstate VW club motorkhana is expanded to become the ‘1970 All-State Rally’, involving the VW clubs of VIC, NSW, SA and ACT, plus the Formula Vee Assn, Albury Car Club and the Pacific Auto Club. A motorkhana is held at the Albury showgrounds (won by VWCVIC), and a Formula Vee race at Hume Weir. This event becomes known as the first ‘Bug-In’. Volkswagen retail sales grow by 11.9%, and VW re-passes Hillman to move back up to 9th place. LNC Industries makes its first million-dollar net profit ($1,140,000) although this is largely due to expansion of its franchises and increasing diversification (such as buying Hunt Bros Ford dealers). The surplus ex-VW Australasia Plant No.2 on the Princes Hwy at Clayton, which includes the former administration centre, parts warehouse and engine assembly complex, is sold for $1.8 million. This complex, separate from the main Plant 1 at Clayton, was occupied by other businesses for years afterwards, and was eventually demolished in the 1990s for a new industrial estate. 16,545 Volkswagens are sold – 590 VW 1300s, 7,309 VW 1500s, 2,938 VW 1600s and 5,708 Transporters. LNC Industries takes over the state distributor of VWs in QLD (Annand and Thompson Holdings Ltd). The former Melbourne-based VW business, Volkswagen (Services) Ltd, is liquidated once LNC writes off the losses inherited with the business. LNC already has its own financial services division, Larke-Neave Investments Limited. The 1500 Beetle is discontinued in February, and replaced by the new 60-bhp twin-port 1600cc ‘Superbug S’, also locally CKD-assembled in Clayton. It is completely new from the windscreen forward. Macpherson-strut front with disc brakes, a redesigned fuel tank, flat-laying spare tyre and larger front boot in the bulbous nose, and the sophisticated double joint rear end. They also feature crescent vents behind the side windows, and Volvo-style seat belt latches. Both manual and semi-auto versions are available, with the manual Superbug S retailing for $2,144. A special tarted-up, accessorised and striped ‘Formula Vee’ version is later available to order at extra cost. The 1300 Beetle is upgraded to a twin-port 52-bhp version of the 1300 motor, manual only, for $2,085. It still has front drum brakes and a swing-axle rear. The Type 3 range is upgraded with US-style high-back front seats with integral headrests. The Transporter has some important changes, including front disc brakes and rear brake pressure regulator, wider rear track, new perforated 4Jx15 wheels, optional brake circuit warning light, twin-port cylinder heads and relocated oil cooler. LNC’s former Victorian agency for Colt and Bellett, Canopus Motors, had ceased trading in 1967 when Mitsubishi took over the franchise. The dormant LNC division is now restarted as LNC’s Victorian agency for industrial engines (including Volkswagen), and named Engine Powered Equipment Pty Ltd. LNC takes this step due to an increase in demand for VW industrial engines by the Australian Army. Lanock Motors is encouraged by the good trading results for its new agency at Bondi Beach, so negotiations begin to open more Lanock Motors branches at Bankstown and Maroubra. The previous VW agency in Bankstown, Robert Dewley Motors on South Terrace, has recently dropped VW and become a Datsun dealer. Another agency, Cloughs Pty Ltd on Canterbury Rd (previously a Vanguard / Rootes dealer), takes on VW instead and a Bankstown Lanock Motors never eventuates. 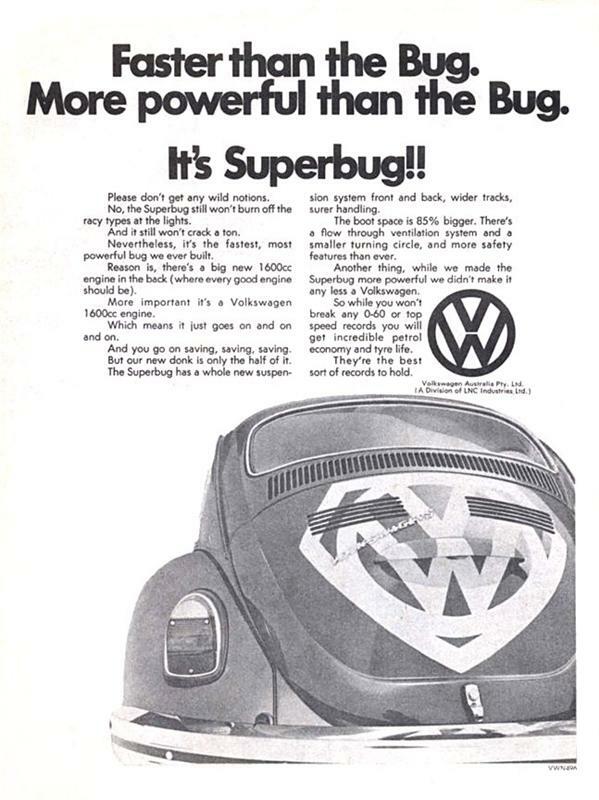 In spite of some stock shortages Volkswagen car sales increase again, by 12.9% thanks to the popularity of the new Superbug. VW re-passes Austin and moves back up to 8th place in the market. Sadly, this would be the last major sales increase of the air-cooled era. 19,138 Volkswagens are sold – 1,063 VW 1300s, 1,088 VW 1500s, 10,090 VW 1600s and 6,897 Transporters. LNC Industries purchases the distributor and largest VW dealership group in South Australia, Light Motors. This now gives LNC Industries direct representation in every Australian state. LNC Industries, Volkswagen Australia’s parent company, moves out of the City offices on William St and into their new executive head office in the BMA Tower, 815 Pacific Hwy Chatswood. The William St premises had been the original LNC head office and showroom since the formation of Larke, Neave and Carter in 1926, but were now unsuitable in both size and location. The former head office (and Lanock Motors agency) is closed and sold off, the first Lanock Motors agency to close. LNC’s various divisions are consolidated, with Volkswagen (and central computer centre) at North Ryde; Lanock Motors at their Waitara branch; Ruslit Motors at Auburn, Grenville Motors at Darlinghurst and Lanock Motors (South Coast) at Wollongong. Lanock Motors opens another Sydney VW agency at Maroubra, utilising the capital of another dormant LNC company, Taylorcraft (Air Cushion Vehicles) Pty Ltd, which increases VW’s penetration in the affluent eastern suburbs. Recognising the recreational caravan and camping boom, Lanock Motors also establishes a new VW Campmobile rental business, based at the Camperdown branch, initially with a fleet of six but soon expanding to several dozen Kombi Campmobiles. With Datsuns now outselling VWs by nearly two to one in Australia, and more Datsuns being made at Clayton than VWs, the first discussions on Nissan acquiring part-ownership of the factory take place, but nothing eventuates. 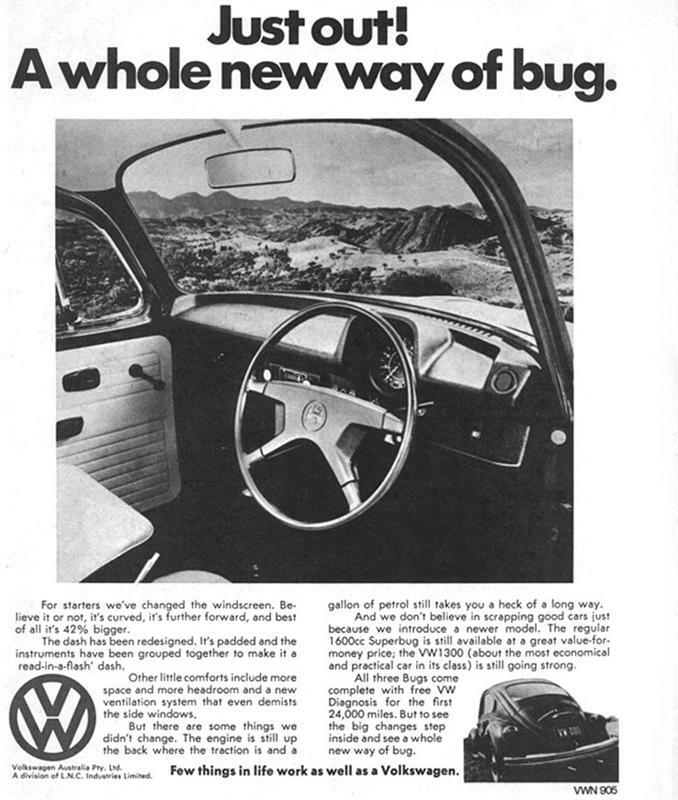 Both the 1600 Superbug S and 1300 Beetle are updated with four sets of louvres on the engine cover, 4-spoke steering wheel and ignition lock with the wipers now operated by a column stalk; white reversing lamps in the taillights, and extra dash vents. The Superbug also gets a slightly larger rear window, and US-style highback seats with inbuilt headrests. 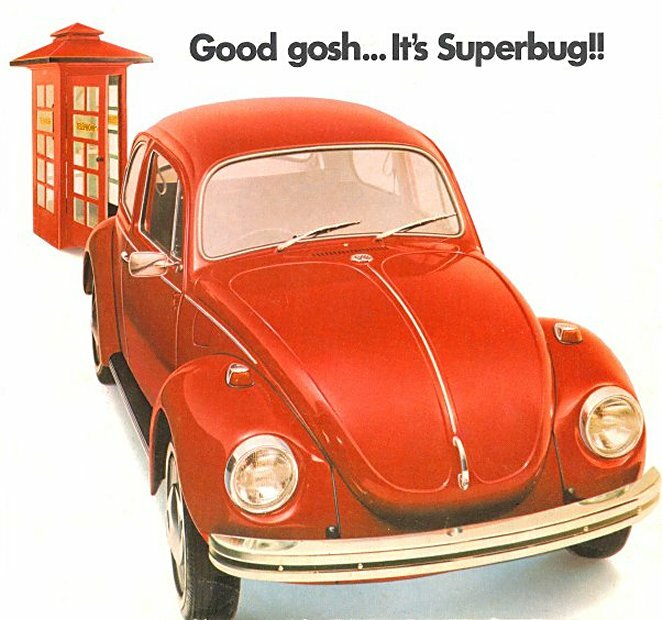 Later in the year a Commemorative Edition Superbug is released, with carpets, red-wall tyres and a glovebox medallion, celebrating the Beetle passing the Model T Ford’s production total. Just 1,500 are made. The Superbug also gets a VW Diagnosis socket in the engine bay, being a standard part of the German-made CKD kit. LNC Industries claims an Australian first with the introduction of the computerized diagnosis system, already successfully introduced in European and American VW dealerships. VW Diagnosis signage is installed at VW dealers, and even VW ads on TV promote the new system. 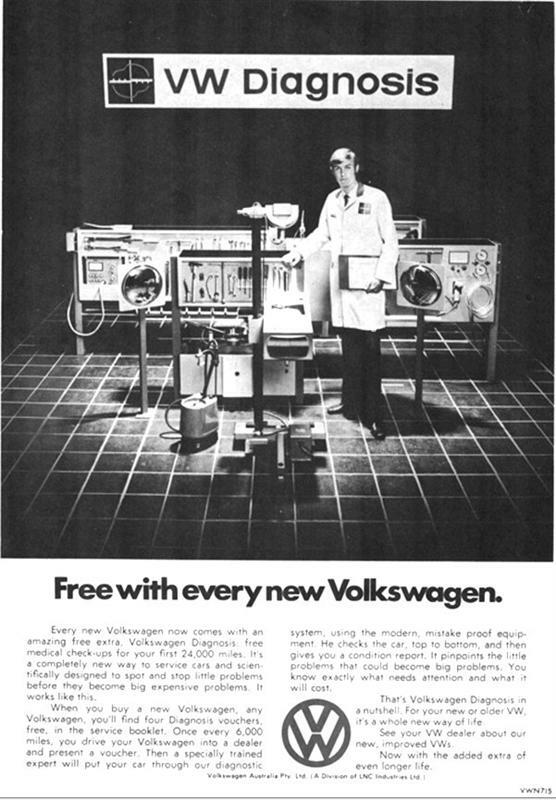 However, apart from some trial machines imported for Lanock Motors, the expensive VW Diagnosis machines (made by Siemens) were never installed in Australian VW dealerships. Type 3s also get the 4-spoke steering wheel, reversing lights and VW Diagnosis socket, as well as improved brakes and side-intrusion bars in the doors. The Transporter gets a modified engine carrier and gearbox mounting, VW Diagnosis socket, bigger rear taillights and larger, squarer rear air intakes. Several German-made Type 181s are imported for evaluation and possible sale to the Australian Army, but the Army rejects them for being too small and not 4x4. The Type 181 is not released for civilian sale either. VW’s sales suffer a major drop of 30%, but even with Austin and Morris merging to form Leyland Australia, VW manages to hang on to 8th place. 14,909 Volkswagens are sold – 908 VW 1300s, 9 VW 1500s, 7,649 VW 1600s and 6,343 Transporters. LNC Industries lose their 25-year Rover/Land Rover franchise in June to the newly created Leyland Australia. By way of replacing Rover, LNC gains the Australian franchise for the Japanese Subaru in July. Rather than creating a new dealer body, as they did with the Rover, Rambler, Chrysler and Yamaha franchises, LNC simply begins distributing and selling the Japanese cars through their existing Volkswagen head office and dealer network. VW dealers are re-signaged to become joint Subaru/VW dealers. A new IBM System/370/135 mainframe computer (a mid-range model with DAT virtual memory) is installed at the North Ryde head office. Seeking further investment in the leisure industry, LNC Industries takes ownership of Adelaide-based Motor Cavaran Holdings Pty Ltd and their subsidiary, Eric W. Sopru Pty Ltd, makers of the Sopru VW Campmobile conversion. A new Sopru head office and workshop is established in Beaconsfield St, Auburn, joining existing Sopru workshops in Adelaide and Melbourne. These Sopru campers are then sold through Australian VW dealers as new ‘factory’ VW Campmobiles, with a full VW warranty and factory parts and service support. The German-built Westfalia VW camper was never sold in Australia. The British Dormobile company also makes Australian VW Kombi conversions at their Fyshwick, ACT workshop, and these are also sold as an ‘official’ conversion for a short time, with the same VW warranty and parts and service support as the Sopru conversion. However the Sopru conversion has a superior vertical-raising roof over the side-raising Dormobile roof, and within a year the Sopru predominates in sales and the Dormobile is removed from the ‘factory’ Campmobile brochures. The booming camper, caravan and leisure industry sees other ‘non-factory’ companies begin converting vehicles to campers. The VW Kombi is the most popular, being the market-leading 1-tonne van. 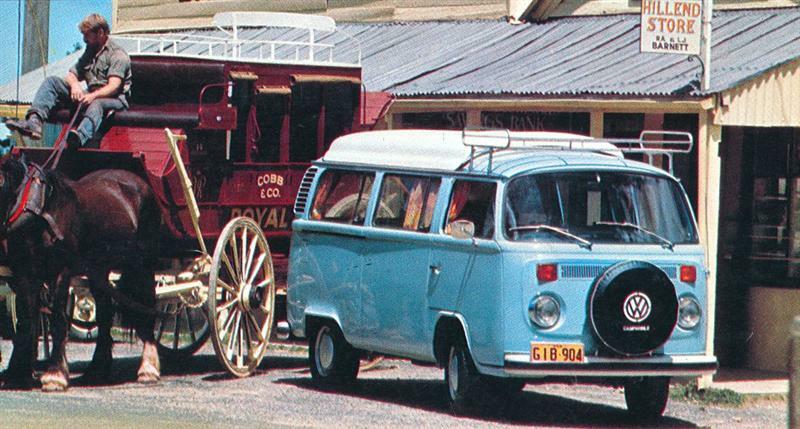 Sunliner, Camperize, Swagman (Austro-Campaway), Trakka Van and John Terry the Kombi King (Discoverer) are some of the most popular local converters. In April the redesigned ‘Superbug L’ is released. Mechanically identical with the previous Superbug S, but with new curved windscreen, shorter bonnet, round ‘elephant foot’ taillights on reshaped rear guards and redesigned, fully padded dashboard with binnacle speedo and two-speed fan. It retails for $2,629. The 1300 Beetle is updated with padding over its original flat dashboard, and the Superbug’s bigger taillights on the same reshaped guards, and now sells for $2,409. The Transporter has a new strengthened front, with safety crumple zone and bigger front disc brakes. The front blinkers are moved up higher. The Type 4-based 1700cc engine is available as an option, with a top hatch at the rear. The Transporter becomes the top-selling model in the local Volkswagen range, and for the first time VW sells more Transporters than cars. The Type 3 receives some minor revisions to seat mountings, door handles and lighting. Assembly ceases in September as the CKD kits run out; it had already been discontinued in Germany. 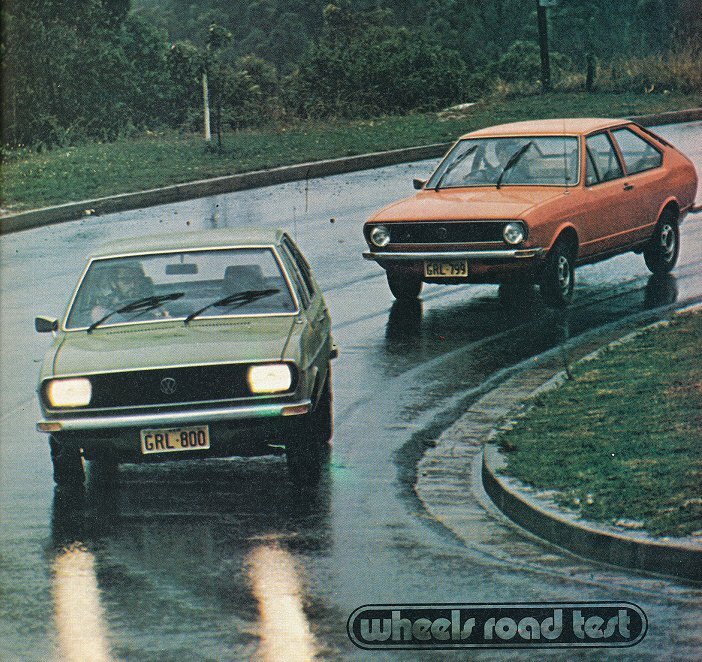 The Australian Type 3 is discontinued, and its place at Clayton is to be taken by the new Passat. The first Passat CKD kits arrive and the former Type 3 assembly line is set up for VW’s revolutionary new model. Australia will be the first country outside of Germany to assemble the Passat. All local Volkswagens are fitted with metric km/h speedos, as Australia is converting to the metric system. Volkswagen dealers offer genuine accessory clear plastic km/h overlays for older models. 15,966 Volkswagens are sold – 924 VW 1300s, 7 VW 1500s, 6,620 VW 1600s and 8,415 Transporters. A new era for Volkswagen as the water-cooled, front-drive Passat is released for sale in February, all models locally CKD-assembled at Clayton. The Passat is the first ever 4-door Volkswagen sedan sold in Australia. It is available in 1300 69-bhp two-door, and 1500 86-bhp four-door and wagon versions. The 1300 Passat starts at $3,348, while the 1500 Passat is $3,698 for the 4-speed manual or $3,998 for the auto. There is also a booted sedan version with different grille and luxury trim, badged as the Audi Fox. It starts at $4,488. The high performance 1500TS two-door Passat appears in May, as does the 1500 Station Wagon. The distinctive four-headlight 98-bhp Passat starts at $3,895, while the Wagon is $3,898 (manual) or $4,198 (auto). The totally modern Passat is an immediate hit with the Australian public, quickly outselling both the $2,569 1300 Beetle and $2,798 Superbug combined. It garners rave reviews in the local motoring press, being equal to the Holden Kingswood in interior room but superior in driver comfort, economy and manoeuvrability. The Passat is named Wheels Magazine’s Car Of The Year, the first ever such award for VW in Australia. Passat sales would have been even higher if not for problems with labour shortages, supply of parts from local and overseas suppliers and some quality control issues at Clayton, causing considerable delays in providing finished vehicles to dealers. LNC Industries takes over Larke Hoskins Pty Ltd, distributors and dealers for Leyland, Renault, Jeep and Chrysler vehicles. This brings things full circle, as LNC’s 1924 ancestral company (Larke, Neave and Carter Pty Ltd) was originally part of the Larke Hoskins group (then an Austin dealer) before becoming independent. Annand and Thompson, and Western Motors, begin distributing Larke Hoskins’ vehicles in addition to VWs and Subarus. LNC boss Doug Donaldson predicts holding 10% of the Australian 4WD market with Jeep. The Superbug L gets an updated front suspension with Negative Steering Roll Radius, black wiper arms, and a fluted number plate light cover. Later the seats are updated to the 3-point mounting design. The 1300 Beetle loses some of its chrome window trim and reverts to plain ‘cal-look’ rubbers. The Transporter’s Type 4 engine is upped to 1800cc (‘more power to the workers’), while the 1600cc upright engine gets a paper air cleaner. The petrol flap is deleted and replaced by a flush cap. As Australia has now metricated, the speedo is also metric as with the other Australian VW models. Volkswagen returns to the famous Bathurst race – now called the Hardie-Ferodo 1000 – for the first time in 5 years. Orange City Motors enter a solitary VW Passat TS in the 1301cc-2000cc Class B, driven by David Seldon and Peter Webster. They qualify in 45th place and compete against Cooper S Minis, Alfa Romeos and Honda Civics. The Passat did not finish the race, however, retiring with electrical problems after 101 laps. This very wet Bathurst race was won by John Goss and Kevin Bartlett in their Ford XA GT Falcon Hardtop. In spite of good Passat sales, VW’s overall sales drop another 15.3% due to buyers turning away from the Superbug. It loses more than two thirds of its previous sales. VW is passed by Honda on the local market and falls to 9th place. 14,111 Volkswagens are sold – 957 VW 1300s, 2,025 VW 1600s, 3,411 Passats and 7,718 Transporters.